For this article, I was able to find a good dataset at the UCI Machine Learning Repository. This particular Automobile Data Set includes a good mix of categorical values as well as continuous values and serves as a useful example that is relatively easy to understand. Since domain understanding is an important aspect when deciding how to encode various categorical values - this data set makes a good case study. Since this article will only focus on encoding the categorical variables, we are going to include only the object columns in our dataframe. Pandas has a helpful select_dtypes function which we can use to build a new dataframe containing only the object columns. Before going any further, there are a couple of null values in the data that we need to clean up. Now that the data does not have any null values, we can look at options for encoding the categorical values. There are two columns of data where the values are words used to represent numbers. Specifically the number of cylinders in the engine and number of doors on the car. Pandas makes it easy for us to directly replace the text values with their numeric equivalent by using replace . If you review the replace documentation, you can see that it is a powerful command that has many options. For our uses, we are going to create a mapping dictionary that contains each column to process as well as a dictionary of the values to translate. While this approach may only work in certain scenarios it is a very useful demonstration of how to convert text values to numeric when there is an “easy” human interpretation of the data. This concept is also useful for more general data cleanup. The nice aspect of this approach is that you get the benefits of pandas categories (compact data size, ability to order, plotting support) but can easily be converted to numeric values for further analysis. Label encoding has the advantage that it is straightforward but it has the disadvantage that the numeric values can be “misinterpreted” by the algorithms. For example, the value of 0 is obviously less than the value of 4 but does that really correspond to the data set in real life? Does a wagon have “4X” more weight in our calculation than the convertible? In this example, I don’t think so. A common alternative approach is called one hot encoding (but also goes by several different names shown below). Despite the different names, the basic strategy is to convert each category value into a new column and assigns a 1 or 0 (True/False) value to the column. This has the benefit of not weighting a value improperly but does have the downside of adding more columns to the data set. Pandas supports this feature using get_dummies. This function is named this way because it creates dummy/indicator variables (aka 1 or 0). This function is powerful because you can pass as many category columns as you would like and choose how to label the columns using prefix . Proper naming will make the rest of the analysis just a little bit easier. The other concept to keep in mind is that get_dummies returns the full dataframe so you will need to filter out the objects using select_dtypes when you are ready to do the final analysis. Depending on the data set, you may be able to use some combination of label encoding and one hot encoding to create a binary column that meets your needs for further analysis. For the sake of discussion, maybe all we care about is whether or not the engine is an Overhead Cam (OHC) or not. In other words, the various versions of OHC are all the same for this analysis. If this is the case, then we could use the str accessor plus np.where to create a new column the indicates whether or not the car has an OHC engine. This approach can be really useful if there is an option to consolidate to a simple Y/N value in a column. This also highlights how important domain knowledge is to solving the problem in the most efficient manner possible. In addition to the pandas approach, scikit-learn provides similar functionality. Personally, I find using pandas a little simpler but I think it is important to be aware of how to execute the processes in scikit-learn. 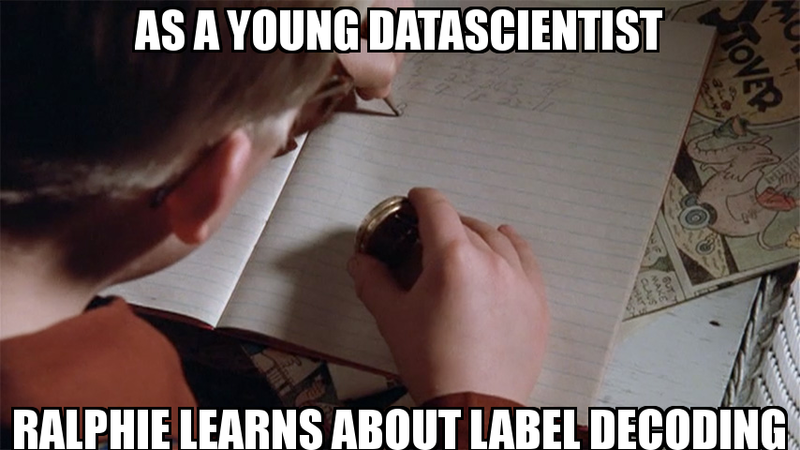 Scikit-learn also supports binary encoding by using the LabelBinarizer. We use a similar process as above to transform the data but the process of creating a pandas DataFrame adds a couple of extra steps. The next step would be to join this data back to the original dataframe but in the interest of article length, I’ll skip that. There are even more advanced algorithms for categorical encoding. I do not have a lot of personal experience with them but for the sake of rounding out this guide, I wanted to included them. This article provides some additional technical background. The other nice aspect is that the author of the article has created a scikit-learn contrib package call categorical-encoding which implements many of these approaches. It is a very nice tool for approaching this problem from a different perspective. Here is a brief introduction to using the library for some other types of encoding. For the first example, we will try doing a Backward Difference encoding. The interesting thing is that you can see that the result are not the standard 1’s and 0’s we saw in the earlier encoding examples. There are several different algorithms included in this package and the best way to learn is to try them out and see if it helps you with the accuracy of your analysis. The code shown above should give you guidance on how to plug in the other approaches and see what kind of results you get. Encoding categorical variables is an important step in the data science process. Because there are multiple approaches to encoding variables, it is important to understand the various options and how to implement them on your own data sets. The python data science ecosystem has many helpful approaches to handling these problems. I encourage you to keep these ideas in mind the next time you find yourself analyzing categorical variables. For more details on the code in this article, feel free to review the notebook.